Director : Daniel M. Ashe: USFWS. : Ban Endangered African Animal Trophy Imports From Namibia & SA. Director : Robert G. Dreher : USFWS. Trophy Hunters have killed pregnant female, a Critically Endangered Black Rhino in Namibia for a Trophy. Only last year they did this , they are so greedy and corrupt they are massacring everything that moves . Ten Hunting Permits are each year given to South Africa and Namibia from CITES, which, allows them to sell Hunting Permits to kill non- breeding males only. You have your chance here and now on this petition to challenged the laws . It wont happen again in public and we have only days left to do it. Save The Rare Desert Elephants only 70 breeding animals ; meaning, there are less than 10 Elephant Bulls which, have at least 5 / 6 Hunting Permits issued and being sold now . Help saved the B R and the Desert Elephants from American Trophies Hunter's Greed and Vanity, by signing and sharing this petition . THE USA ; FISH AND WILDLIFE SERVICE (USFWS) DECISION IS NOW PENDING, TO IMPORT THE BLACK RHINO. THERE ARE between 1,700 /50 LEFT IN NAMIBIA , just over 4,000 BRs in the whole world , THE HUNT IS IMMINENT IF WE DONT BLOCK THE TROPHY IMPORTS!!! . YOU SEE, NO IMPORT LICENCES INTO THE USA GRANTED , NO HUNTING PERMITS ISSUED !!! The USFWS Hunting Permit Applications have been announced for 2 Black Rhinos , for 2 Americans including CK , to import BR trophies into the USA. This petition needs a lot of support to make a difference, ideally we need to reach close to a 25,000 signatures or more TO TELL USFWS THAT WE OBJECT TO CRITICALLY ENDANGERED ANIMALS TROPHY IMPORTS INTO THE USA FROM AFRICA , can you make this happen ? CAN WE REACH THIS GOAL ? 'The Namibia wildlife is at risk of going extinct because the animal populations are very low and vulnerable because the WWF are 'cooking the books' to allow Trophy Hunting to continue from the most fragile wildlife populations on earth. The WWF should be protecting the animals , however, they are openly lying and grossly exaggerating wildlife population numbers to keep a Trophy Hunting Stance in Africa , as they control funding streams from Global Charity Donations and USAID; to ALL the African countries from the USA and Congress , who is lobbied by the USA Pro-Hunting Lobby Groups to maintain Trophy Hunting, from almost extinct animals populations . The African people are powerless to stop their wildlife being massacred into extinction. We urge the USFWS to consider their decision and listen to the world instead of the voice of a few and protect Africa through your laws and policies . 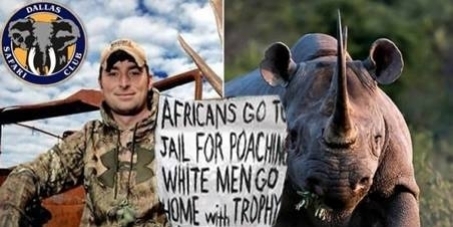 COREY KNOWLTON, HAS MASSACRED 120 RARE ANIMALS IN THE WORLD IN THE LAST 10 YEARS , AND HE PAID $350.000 FOR THE RIGHTS TO KILL A CRITICALLY ENDANGERED BLACK RHINO, ON THE BRINK OF EXTINCTION. COREY KNOWLTON IS KILLING A BLACK RHINO FOR A HUNTING TV CHANNEL IN AMERICA, FOR ENTERTAINMENT !! WE THINK THIS IS IMMORAL, ESPECIALLY WHEN THE POACHERS ARE SLAUGHTERING THEM TOO !!! !!! !!! Ten Hunting permits to kill BR's are issued every year for Trophies from Namibia and South Africa because of ‘ICUN: Mike Knight's HUNTING RECOMMENDATIONS / The Lead Professional working with the Namibia Black Rhino Conservation / Hunting Projects is getting funding from the WWF's International Charity Funding Purse and he is also working with Corey Knowlton's purchase . Even though the Black Rhino Species is under attack from poachers and going extinct and classed as Critically Endangered, CITIES have allowed TEN animals to be massacred for Trophies every year because of the WWF and ICUN: Mike Knight's corruption . We want to challenge this rule and over turn it so that the Black Rhinos are protected , by blocking USA Trophy Imports . There are less than 1,700/50 Black Rhinos left in Namibia'. In the 1970's there were 65, 000 in Africa , now there are 4/5, 000 Black Rhinos in the world. In Namibia there are now less than 1,000 Black Rhinos in protected areas an estimated 700/50 which, are Free Range. So once the poachers start seriously targeting Namibia (it has already started) , at the rate of the South African incidents, they will wipe out the total Namibian population of Black Rhinos in less than two years. NOT ONE MORE CAN BE AFFORDED TO BE HUNTED! In Africa old age is respected: by extension, it is un-African and basically unethical not to allow an old male that sired many calves a peaceful retirement, in the same way as breeding bulls in the cattle world are put out to pasture, not sent to the butcher, once they stop being productive. Sir, I have struggled to understand why SCI and DSC continue to put prices on the heads of our wildlife. It is laughable that they even think they have any right. The wildlife of a nation remains the sovereign property of its people. Would this not mean then, sir, that privatizing such public property would, in fact, be a gross violation of the rights of the African people? I will let you ponder over that for a while. We are in the wake of a crisis that has gripped our region. Poachers have decimated our herds, and Africa is no longer teeming with wildlife. You kind sir, have been duped into believing that your hunt will aid conservation in Africa. THE NAMIBIAN WILDLIFE IS UNDER THREAT FROM CORRUPTION !! The natural world is under attack like never before the ecosystem and food chain is breaking down in Africa and the African Tribes and animals affected, need protection . This is NOT SUSTAINABLE HUNTING !! PLEASE STOP THE USA TROPHY HUNTERS IN NAMIBIA FROM KILLING THE LAST OF THE DESERT ELEPHANTS. THERE ARE ONLY an estimated 70 BREEDING ADULTS LEFT , LESS THAN 10 BREEDING MALES , OF THE VERY UNIQUE DESERT ADAPTED ELEPHANTS , THEIR NUMBERS ARE ON THE DECLINE , AND THEY ARE DOWN TO 'EXTINCTION STATUS' AGAIN, THEIR EXISTENCE IS THREATENED THEY ARE ON THE BRINK OF EXTINCTION . Please watch the Youtube link : ' Elephants in the Namibian desert - Wild Africa - BBC 2009 '; this is independent evidence stating that there are '100 or so Desert Dwelling Elephants; being supported by the Desert " . The Namibia Ministry has just announced there are 20,000 backed by WWF . The relentless massacring is destroying the African Ecosystem and the Tribal People's Food Chain. ; this is being done by the Media Invisible Wealthiest White People, and the most Powerful People in the world !!!!
" Unique Elephants ( There are only 100 or so Desert Dwelling Elephants in Total , supported by the Namibi Desert )"
THE WEALTHIEST PEOPLE ARE MASSACRING ALONGSIDE THE POACHERS ! They are wiping out the last of the African animals unchallenged for hundreds of thousands of Dollars each, paying for Unsustainable Hunting in under -developed countries where populations of animals are being exaggerated by the WWF who are informing CITIES and USFWS, as they keep the doors open for Trophy Hunting to continue from almost extinct populations of animals , that , are being wiped out by poachers . THIS DELIBERATE EXTINCTION HAPPENING TO THE AFRICA WILDLIFE DONE BY THE USA CITIZENS IS OUTRAGEOUS !! This exploiting of the African countries; is directly affecting the poorest people in the world, who are victim to it ; as their animals are being massacred off this planet into extinction forever in one generation ; for ornaments, for TV Hunting Channels Entertainment and Mono-Culture Agriculture , which means 400,000 acres plus lands of one crop in a plantation . Which , means land is being Grabbed by USA Corporations for Food Globalisation, Food production . No people and no wildlife can be tolerated on the plantations , so the land Giants are being massacred into extinction in the wild to allow this bio-diversity backed 100% by WWF , so that African Animals will only exist in Canned Hunting parks and farms in a small number in the future . THE UNIQUE ADAPTED DESERT DWELLING ELEPHANTS ARE NOT LARGE ENOUGH IN THIER POPULATION TO CULL !! 35,000 AFRICAN ELEPHANTS WERE MASSACRED BY POACHERS LAST YEAR ALONE. THE ANIMALS ARE GOING EXTINCT ; MORE THAN THE WHOLE DESERT POPULATION OF ELEPHANTS ARE KILLED EVERY DAY, IN AFRICA. Please Ban Imports from Namibia into the USA of ALL Critically Endangered African Animals IMMEDIATELY ! The Desert Elephants population in 20 years has risen from 52 members to less than 100( they are rapidly declining) . Namibia's Desert-Dwelling Elephants are one of only 2 populations of Elephants in Africa living in a desert environment (the other is in Mali). The majority of the world population does not think massacring endangered animals is appropriate whilst , the poaching of the African Animals is out of control in Africa , and allowing imports of African Animals dead or alive by the USFWS shows a lack of respect and understanding for people who are actually risking their lives and struggling to keep these animals on this planet for longevity . There were 5 MILLION Elephants in Africa 40 years ago , now there are between 300.000/ 600,000 Elephants , of which, 100 Elephants are killed everyday by poachers , 700 a week and so on . The whole of the equivalent population of the DESERT ELEPHANTS are being WIPED OUT IN A DAY !! in Africa by poachers , issuing permits to kill more, this is NOT SUSTAINABLE HUNTING !!! “The Convention on International Trade in Endangered Species (CITES), to which the UK is a Party, applies to ensure that trade in listed species hunted for their trophies is only permitted if it is sustainable. In view of concerns raised that the import of hunting trophies of some species from some countries are unsustainable, we have agreed in principle with other EU Member States that stricter measures should be introduced in relation to the importation of hunting trophies of rhinos, lions and some other species. This list will be further considered and kept under review. We will continue working with other CITES Parties and relevant non-government organisations to ensure the long-term survival of this and other important species. I reiterate : 'The Namibia wildlife is at risk of going extinct because the animal populations are very low and vulnerable because the WWF are 'cooking the books' to allow Trophy Hunting to continue from the most fragile wildlife populations on earth, in Namibia. The WWF should be protecting the animals , however, they are openly lying about populations to keep a Trophy Hunting stance as they control funding streams from USAID; to ALL the African countries from the USA Congress , who is lobbied by the USA Pro-Hunting Lobby Groups to maintain Trophy Hunting, from almost extinct animals . Updates 2014 : 3 ' home use ' Bulls have since been shot , putting one of the hunters in hospital . 7 Permits are now Advertised in the USA for 2015. Nothing about what has been reported has been inaccurate so far and what is taking place could not be considered conservation in any shape or form. How do we fight poaching when all you have to do is come up with enough cash to kill these animals legally, FOR FUN! !